More than one in five Latino millennials identify as LGBTQ, according to a recent survey. Latino millennials are the least likely millennials to identify as heterosexual, according to the GenForward Survey project at the University of Chicago. The organization’s recent report, “Millennial Attitudes on LGBT Issues: Race, Identity, and Experience,” found approximately 14 percent of all millennials — defined as those between the ages of 18 and 34 — identify as lesbian, gay, bisexual or transgender. When you break it down by ethnicity, however, Latino millennials were much more likely than other ethnicity groups to self-identify as LGBTQ, or non-straight. The survey found 22 percent of Latino millennials identifiy as LGBTQ, compared to 14 percent of African-Americans, 13 percent of whites and 9 percent of Asian-Americans. To Be Or Not to Be Latinx? For Some Hispanics, That Is the Question. “We were excited that the differences emerged. Often millenials are talked about as a monolithic or homogeneous group where everyone is more or less the same,” Vlad Medenica, a postdoctoral researcher who worked on the report, told NBC News. “One of the aims of our survey is to dig a bit deeper and see how race and ethnicity shape people’s experiences. The fact that Latinx millennials are least likely to identify as straight is a reflection of how important exploring this difference is,” he added. 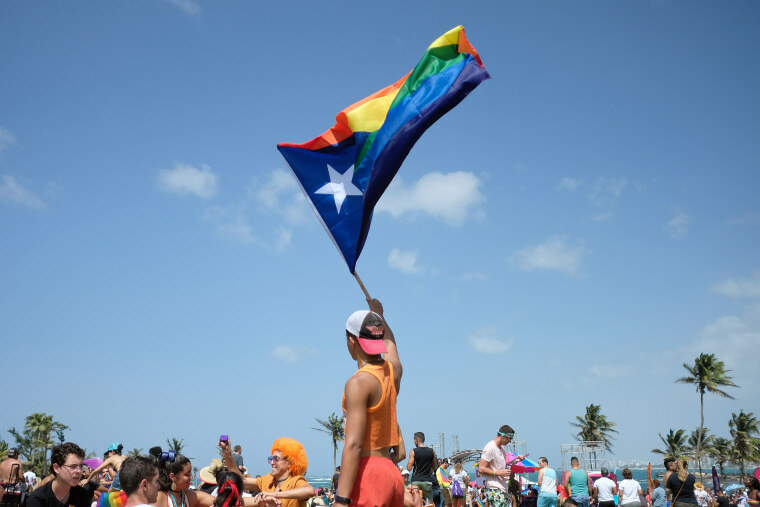 The GenForward findings came as welcome news to LGBTQ Latino advocates, like Herb Sosa, president of Unity Coalition, a South Florida-based, LGBTQ-rights group. “I find it pleasantly surprising that Latinx millenials are identifying more and more as LGBTQ, especially since cultural and social norms usually indicate the other direction, so it's a good thing,” Sosa said. Ishmael Perez, co-founder of Orlando-based Qlatinx, speculated that conservative religious influences among Latinos may have inspired millennials to more openly push back against conservative social norms. On the other end of the spectrum, GenForward found just 9 percent of Asian-American millennials surveyed identify as LGBTQ. This came as a surprise to Glenn D. Magpantay, executive director of the National Queer Asian Pacific Islander Alliance. "Surveys only in English sometimes overlook large swaths of the community and can be skewed,” Magpantay cautioned. “We find that more and more Asian-Americans are coming out as LGBT and so immigrants’ rights and family acceptance have become critical LGBT-rights issues." For this survey, GenForward interviewed nearly 1,900 millennials across 50 states and the District of Columbia. The survey was offered in both English and Spanish. A majority of Latino (61 percent) and Asian-American (53 percent) millennials surveyed said there is “a lot” of discrimination against lesbians and gays in their racial community, compared with 43 percent of African-Americans and 27 percent of whites. When it comes to discrimination against transgender people in their racial community, the percentages who said there was “a lot” of discrimination were significantly higher: 64 percent of Asian-Americans, 58 percent of African-Americans, 49 percent of Latinos and 47 percent of whites. Millennials across all racial and ethnic groups said the two most important issues facing the LGBTQ community are reducing hate crime violence against LGBTQ people and ending bullying against LGBTQ youth, according to the survey. One thing millennials across different racial groups did not agree on, however, was whether issues being promoted by mainstream LGBTQ organizations were aligned with issues confronting LGBTQ people of color. A majority of African-American (53 percent) and Latino (50 percent) millennials believed these issues were “very different.” In contrast, a majority of white (58 percent) and Asian-American (54 percent) said that all LGBTQ people benefit when mainstream LGBTQ organizations fight for basic rights. Medenica said he and the GenForward team hope the survey’s results provide deeper context into millennials as a whole and highlight the differing issues and needs of subsets of this broader group.